The Town of Harrison has been seeing many changes in recent years. The transformation away from an industrial town to a more traditional urban city can be seen all over town. Harrison is getting a dramatic new train station near the recently completed Red Bulls soccer arena and hotel rooms will continue to grow in demand. 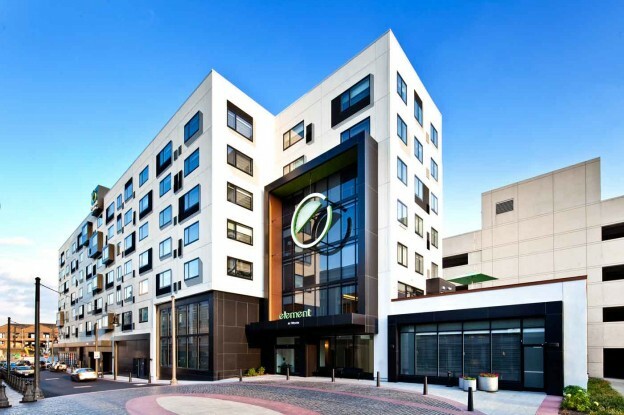 The Element Hotel, part of the Starwood family of hotels, will serve this function and is conveniently located within 100 yards of the train station. The project includes 7 stories of extended stay hotel rooms which wrap an existing 5 level parking deck. A playful exterior creates an artistic design to represent the brand. This entry was posted in Hospitality/Recreation/Resort, Structural Engineering, Sustainable Design, Transit Oriented on October 20, 2014 by swolock.